Above you see our newest table. 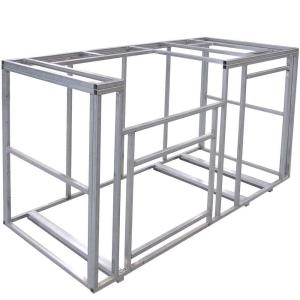 It is made from square tube aluminum powder coated with black finish and the bottom area enclosed so you can add literally any insert your want. As you see it with the Trex counter top and built to fit any 18" ceramic grill the table is yours for $695.00 including the SS door. Want it slightly different? Just let us know and we'll design it just for you! Have you been dreaming of an outdoor kitchen but weren't sure how to get started? Taproot and it's parent store Fireside Outdoor Kitchens have literally made an art form of designing easy to complete outdoor kitchens that can, and have, been shipped everywhere in the country. Let us know what you want and we'll quote it over the email or phone and get your dream started. Want to see examples of Fireside Outdoor Kitchens that have been built from our frame system? Follow this link by clicking here. Our newest addition includes custom built aluminum cabinets that can include literally anything you want for storage space. As seen to the left we can add a simple SS storage door or a warming drawer, cooler bucket, triple drawer, literally anything. We sell everything that goes in outdoor kitchens so we can not only build the cabinet for you we can get you the inserts too. And don't forte the grills, we sell them all! Got an idea for an outdoor kitchen? We can do that. In fact, we have designed and sold the appliances for over 400 outdoor kitchens since 2010.